Rubber Band Machine Gun Spells Office Mayhem | OhGizmo! Here’s a fun weekend project. 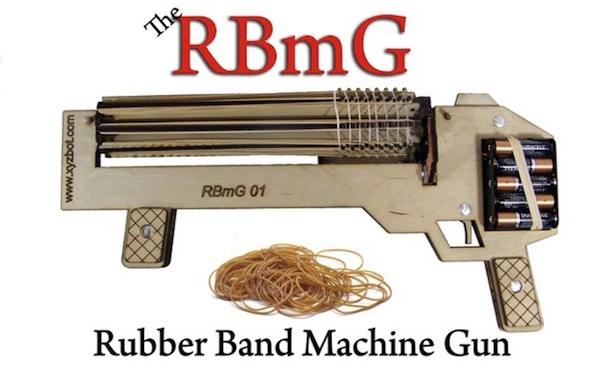 The Rubber Band Machine Gun (RBmG) is a motorized, uh, weapon that fires rubber bands in quick succession, like a Gatling gun, only with less people dying. It comes as an assemble-at-home kit which takes about 30 minutes to put together, and once fully loaded can unleash a barrage of up to 128 bands (loaded carefully) or 64 (loaded not so carefully). It does seem to use batteries for power and is made of wood, and will cost you $49 to own. If you don’t mind a slightly lower quality version, you can even get away with paying $39. It’s a Kickstarter project at the moment so you’ll have to wait 23 more days to see if it gets funded. If it does, a $59 pledge guarantees Christmas delivery.